Over at Splitcoast today, the Free for All Challenge…give me your poor, neglected stamps! Those poor bits of rubber that have yet to see ink!!! If you’re anything like me…there’s a wide of range images to be worked with today! Sad isn’t it? 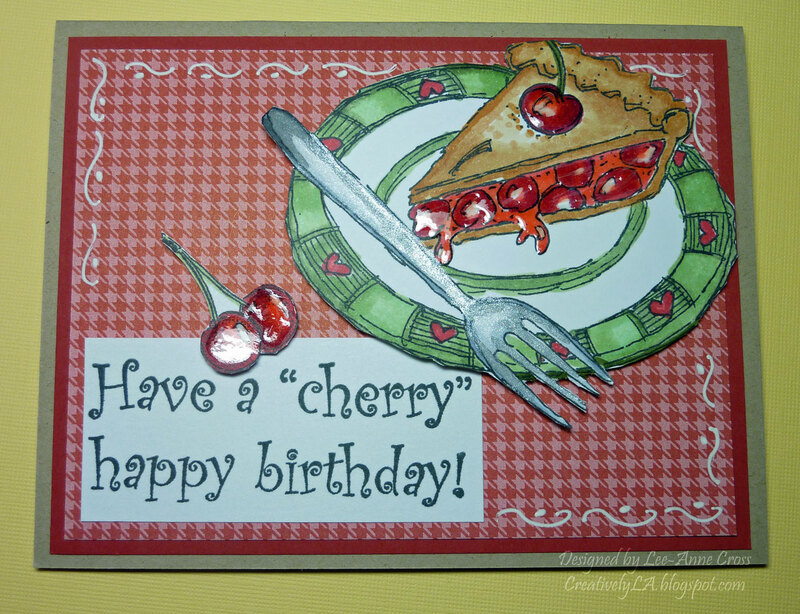 I colored the pie/plate image with Copics and then added some Crystal Effects on the cherries. Yes, that’s what’s causing the glare in my picture LOL! I also added some Pewter Lumiere paint on the fork to give it more lustre. The little cherry image has also been colored with Copics and I added more Crystal Effects (read that as more glare LOL) to them. A very simple layout, so I thought it needed something…so decided to add some doodling. Well, that’s it for today! Have a fantastic weekend!